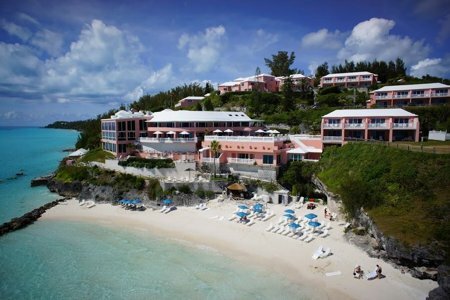 Pompano Beach Club is located on a spectacular cliff overlooking the southwest coast of Bermuda. You get breathtaking views of the ocean and sunset from the resort. Pompano is extremely popular with golfers. The Port Royal Golf Course designed by Robert Trent Jones is located right next to the hotel and is ranked among the top public golf courses in the world. The hillside villas scattered over the wonderful land area have private balcony or terrace overlooking the ocean. 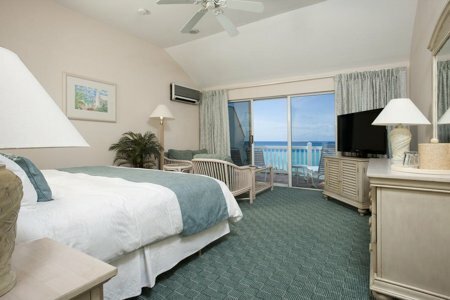 Deluxe rooms are located at oceanfront and have king-size beds, sitting area and spacious ceramic-tiled bathrooms (with double sinks and separate tub & shower). Sliding glass doors open out to a large private patio or balcony. The deluxe rooms offer great ocean views. These rooms have wet bars and showers with oversize tubs. During low tide, we could walk for over 400 feet into the water from the lovely private beach, and the water level was only up to chest high. Snorkeling experience here is simply fantastic due to the clear & shallow waters and is perfectly safe. Bride’s magazine has called Pompano’s waterfront "the best underwater beach in the world". This family run resort also offers a shallow water sandbar which is the only one of its kind. Many beachgoers and others can be seen around the sandbar. Pompano Beach Club has heated fresh water pool overlooking the waterfront. There are three restaurants on site. All have great views of the ocean and serve International cuisine: The more formal Cedar Room, The bistro-style Ocean Grill and The casual Coral Reef Café. A team of international chefs prepare the food. If you choose modified American Meal Plan, an exchange-dining program is offered with two other great Bermuda resorts, Cambridge Beaches and The Reefs, which are also two of our top favorite luxury hotels in Bermuda. Free shuttle service to and from the local Rockaway ferry stop, making it easier for guests to commute back and forth from Hamilton. Blue Water Divers, one of Bermuda’s top scuba diving operators, is a five minute drive from Pompano. Note: Hotels guests get discounted rates. Following rates are for outsiders. Address: 36 Pompano Beach Road, Southampton Parish. Bus Routes: #7 and 8 (both routes operating between Hamilton and Dockyard). Check out Bermuda Hotel Map to view the location of the hotel and others nearby. 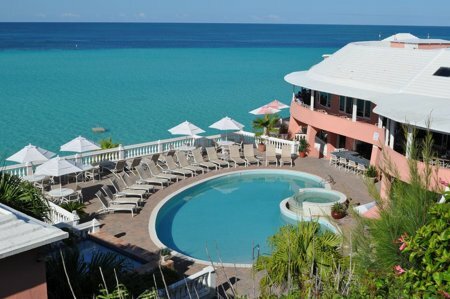 1) Check out Top Bermuda Luxury Hotels for all the great star accommodations in Bermuda. 2) Check out Southampton Bermuda Hotels to know about all the great luxury hotels & resorts in the parish. Raj - Blessings to you and yours...I'm Jen and have had the pleasure of visiting Bermuda twice in my life. The first in 1995, when I took my parents there for my mother's 50th birthday and then in 1998 on a cruise for my dear friends wedding. In '95 we stayed at Pompano Beach Club, which in my humble opinion is the only place to stay there...the owners are amazing loving individuals who embrace the culture of the island beautifully with their staff. I hope one day to bring my husband and daughter there to enjoy the beauty of the island that to this day leave me with an aching heart of the ocean. Very nice place. Excellent service, small beach, sunsets were the best natural feature. We enjoyed from both our room porch and the dining room. Outside porch for all meals available and we recommend this option. Free shuttle takes you to Somerset Bridge, Rockway Ferry or nearby bus stops. Railway Trail gives a walking option to keep you off the narrow roads and is partly shaded, but sidewalks along much of Middle Road help.